For the second time (we did so with our oldest), we chose to wait until birth to find out the gender. We had thrown a few names around over the last couple years, but hadn’t made any decisions and wanted to have a name for a boy and girl ready for the big day. Maybe this was telling, but choosing a boys name was hard!! Luckily for us, we had settled on a girls name fairly early on in the pregnancy and mutually agreed it was the right choice. 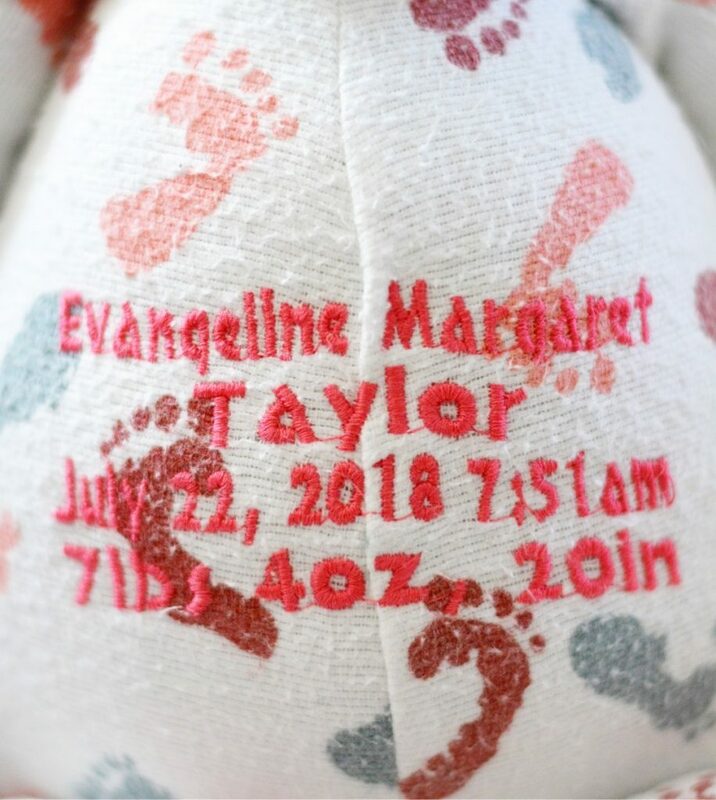 Evangeline is a beautiful and classic name, and one we felt went nicely with her big sissy’s Alexandra and Lily. It’s Greek and means “Good news, bringer of good news”. We believe there is incredible significance in names and this one carries a dual meaning. Our prayer is that Evangeline will share the Good News of Jesus Christ as stated in the Great Commission (Matthew 28:16-20). We want her to boldly proclaim his love and salvation as she “goes and makes disciples of all nations” (think evangelist), and that her authentic faith will exhibit the goodness and glory of God. 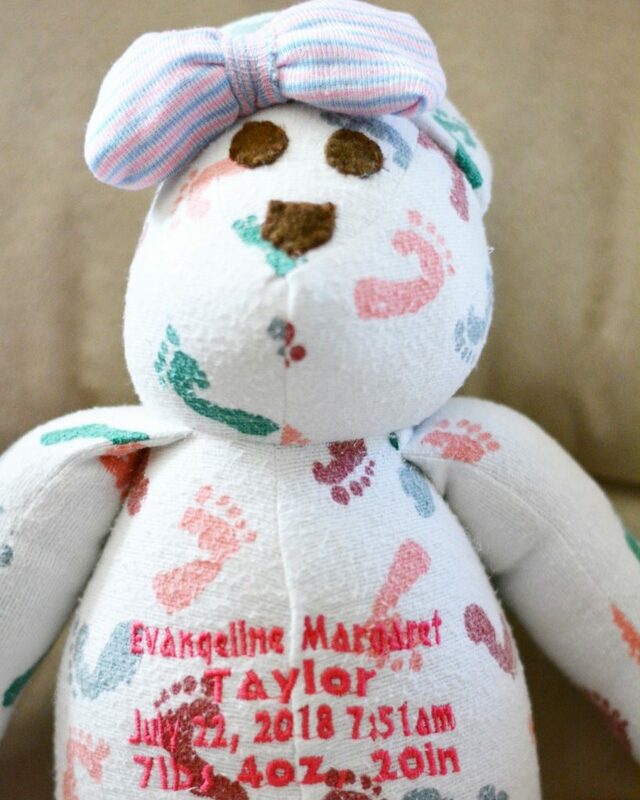 In addition to this, she is our personal “bringer of good news”, being our sweet rainbow baby after experiencing the devastation of two miscarriages. 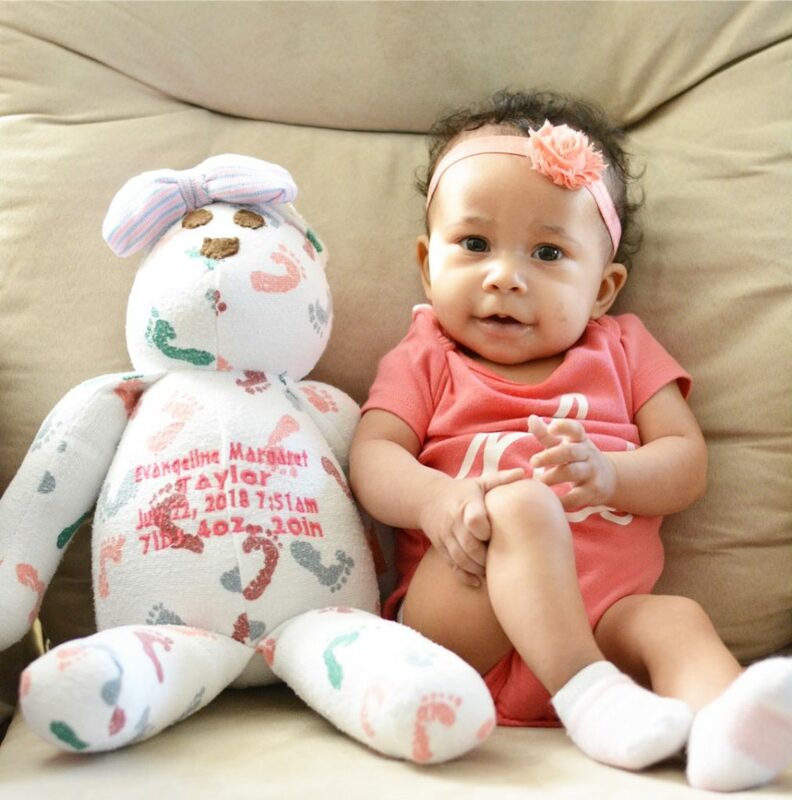 Evie (pronounced with the long e) is the cute nickname that grabbed our attention. And we gave her the middle name, Margaret, to honor my husband’s beloved grandmother who passed away a handful of years ago. We chose not to share our name choices in advance because people (family, friends, everybody lol) has so.many.opinions! Like all things parenting, this decision is a deeply personal one, and we didn’t want to feel deterred in anyway from what we felt the Lord led us to pick for our child. 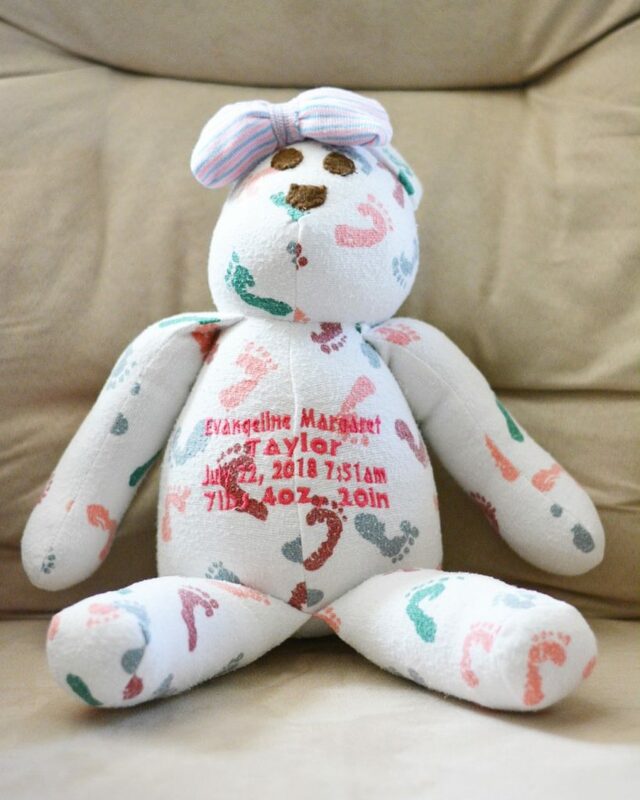 To honor her name and to capture the details of the day she was born, we were gifted this adorable birth bear from Stitches by Natalie. This keepsake brought me to tears when I first saw it! It is made from the blanket Evie received in the hospital and the bow is made out of the first little beanie she wore on her head. 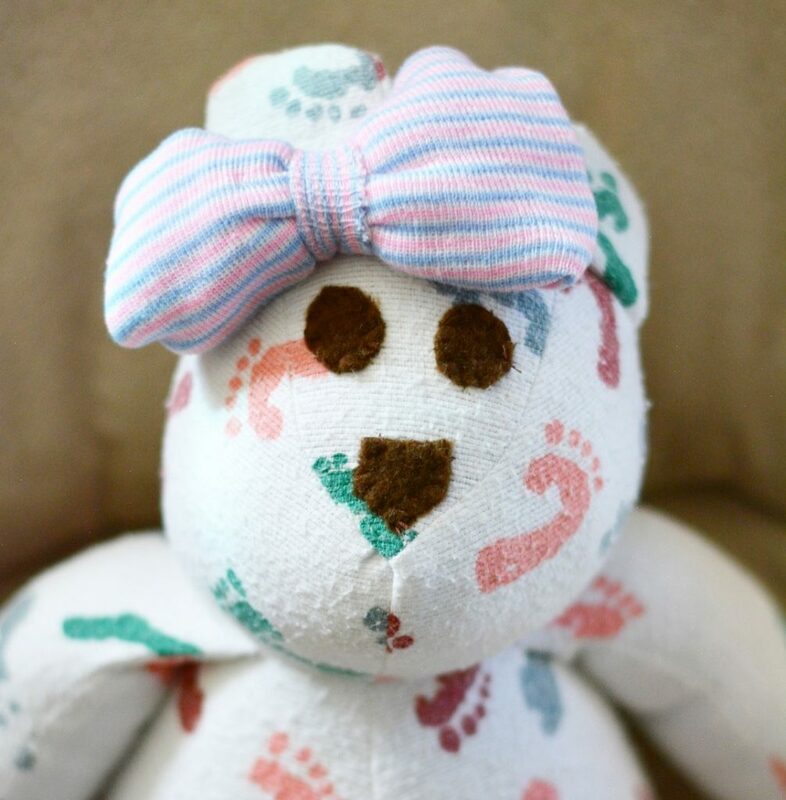 Stitches by Natalie is home of the original birth animal, and you can choose from options ranging from cats to bears, ducks and unicorns and so much more! Use CODE ‘lifeofaministermom’ to save 20% too! We included all the details from her birth and it is something we look forward to sharing with her when she is older. I am incredibly sentimental and will forever cherish this handmade bear!! So that’s what went in to selecting Evangeline. We love it and love her (obviously ;)), and hope she’ll proudly wear her name! Tell me how you decided on the names for your little ones in the comments below, and shop here for a birth animal of your own! We did not find out for any of our 4 either and loved being surprised each time! With each of our children they are named after someone(s) in our family. Our oldest is Lorelai Evelyn, Lorelai means “little Laura” and my sister is named Laura, Evelyn because we liked it and it means “wished for child”. Our oldest boy is Rhett Carlton Thomas. Rhett has been a boy name I have liked since middle school, and thankfully my husband liked it as well, Carlton in my father in law’s middle name and his father’s first name, Thomas is for a dear friend of the family who was my only grandfather figure in my life since both of mine had passed away before I turned 3. Our youngest son is Rowan Andrew John. Rowan was a name we both liked and we had decided then to go with R’s for boys names. Andrew is after my husband and John is after his grandfather and our brother in law. Our youngest is Linnea Jane. Linnea is a name I have liked since high school and my husband also happened to like it, we have known a few people over the years with that name as well. Jane is in honor of so many people in our family. The name Jane is where the names Janet, Janice and Jean are derived from. His moms name is Janet, my mom’s name is Janice and we have several other aunts, grandmas, sisters with the name Jean. It also means “God is gracious” and the year prior to her birth was an extremely difficult one for our family and it is a reminder to us that through our difficult times God is gracious and gives us so many blessings! I absolutely love this Rachel!! 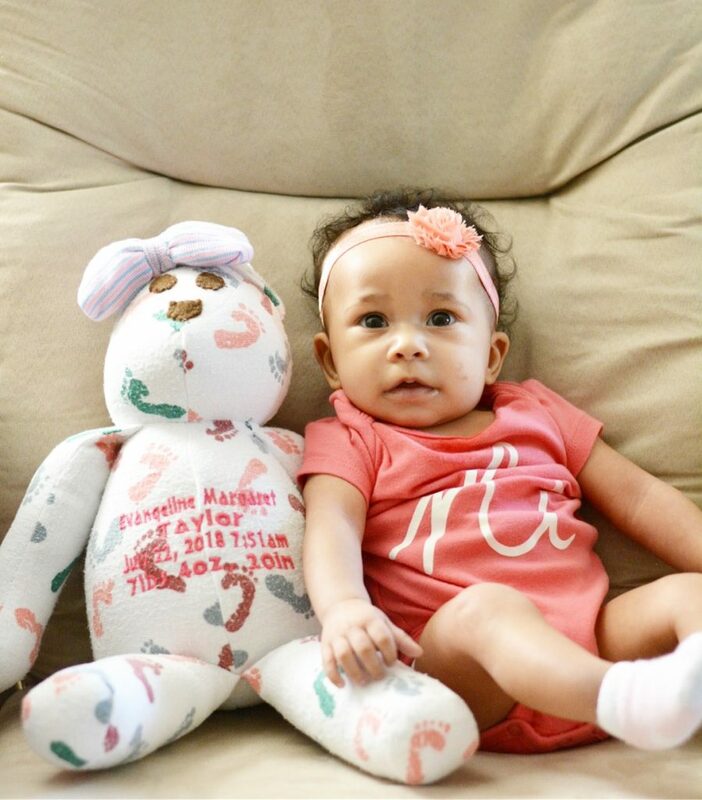 There’s so much significance in each of your children’s names and I love how the family is honored too!! I love this name and is the named we chose for our little that is due earth side in April 2019! I have loved this name for the last 5 years and finally get to use it. We chose to go with Evangelyn I loved the meaning and how beautiful it sounds! Congrats on your little she is absolutely adorable. That’s so sweet Lyndsay!! Congratulations!!! She is a doll, and I love her name so much! Thank you Brandi! I appreciate your kind words! Thank you so much Rachelle!! That is one of my favorite girl names. And she is just as beautiful as her name. I love that bear! What a wonderful keepsake from the time she was born. I’m sure she will treasure it. This is so sweet and I love the meaning of names it is so special! 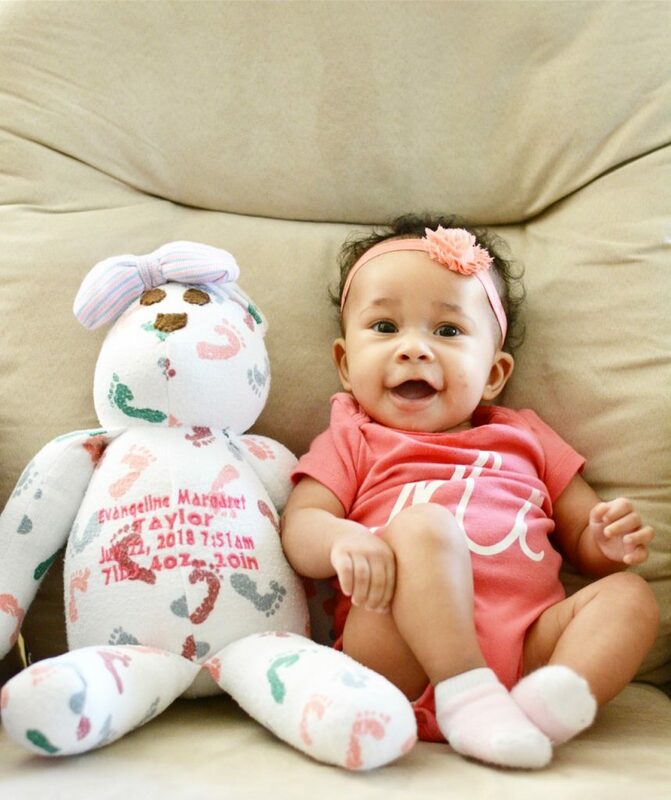 She is precious just like her sisters Patty and love her little doll too. Thank you Nicole! She’s my little sweetie! I love hearing about the signifance of baby names. She’s precious patty! I love that it means bringer of good news!! 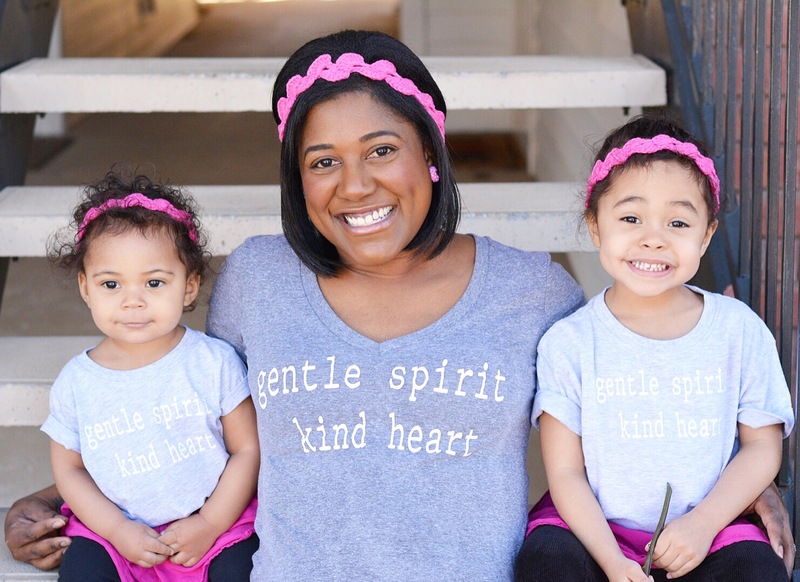 It’s a beautiful name and goes so well with her sisters’ names! Great questions to cover when choosing a name! Details that are often not thought about. Thanks for the list! 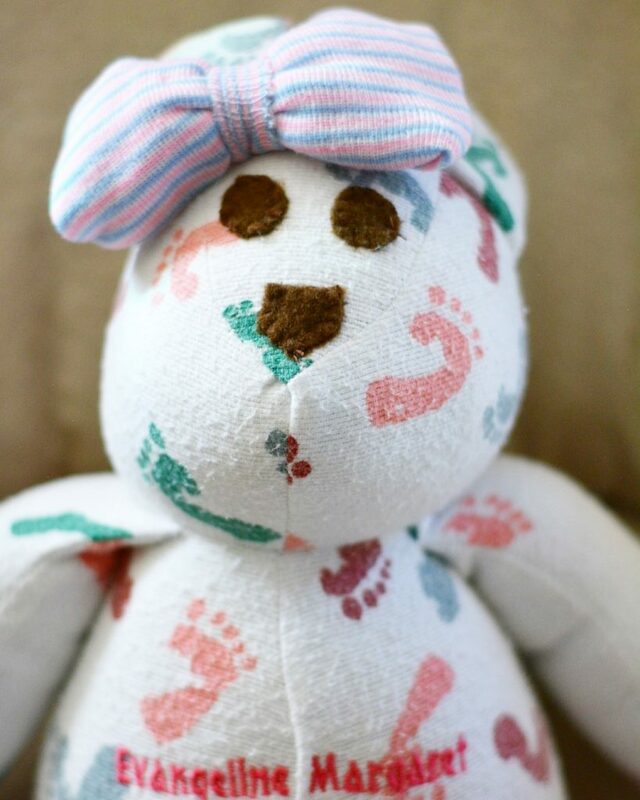 That’s such a cute keepsake bear! And I love the name you chose for her. It’s beautiful just like she is! I love this bear so much. I’m super sentimental and it’s perfect! This is such an amazing story. Also, CUTEST BEAR EVER.